By W. TIMOTHY SUTTON. Sutton is a member of the Maryland Libertarian Party executive board. He hosts the Non-Aggression Principle Thursday nights at 8 pm on Free State Radio. Lately I have become more and more agitated with the workings of our governments. Governments plural. We in Maryland have at least three different governments to whom we are responsible. While most of the media attention rests with the federal government, with good reason based simply on its budget and the taxes we pay to support that bloated monstrosity, many of the most onerous regulations are handed down at the local and state level. This is not a new occurrence, but it is becoming more apparent that the people running our governments don’t know how to leave people well enough alone. I state that this is not a new occurrence and perhaps much of my current vitriol can be based on a sight that I saw on Saturday. I was at the Smithsonian Museum of American History. One of the exhibits was on transportation and one of the artifacts was a “chauffeur’s license.” The accompanying caption to the license stated that “[m]any wealthy automobile owners employed chauffeurs to drive and perform simple maintenance. State licensing helped ensure that the individuals hired were competent.” I don’t know if the caption was simple assumption made on the part of a liberal curator or the actual honest belief of the people of time period. The license was from 1916 so pretty much at the apex of the Progressive Era; shortly after the income tax and Federal Reserve were passed, shortly before prohibition and women’s suffrage. There is a rather equal possibility of both. If the language was added by a liberal museum curator, it has no place in a history museum paid for by the taxpayers and citizens of this country. It is simple naivete. Can you honestly believe that wealthy automobile owners needed the governments help to determine who to hire? Let’s be honest here, this era was not one of fondness for the wealthy. The majority of protections instituted at this time were as a specific result of the Gilded Age abuses. It seems odd that states would worry about protecting the wealthy. No the better rational for such a license was that the state could make money off of it. They would charge for the license and bam another revenue stream. If the language was truly the result of the beliefs of the legislators then they were dumb. Maybe not dumb, but at least drunk on their power. They had a belief that they knew what was better for the people and gosh darn it they were going to give it to them. This newfangled machine was dangerous and deadly and everyone needed licenses and regulations. Here’s a hint, not everyone needed licenses and regulations. It is actually odd that car registrations were required much earlier, twenty years earlier, than drivers’ licenses. This is perhaps a remnant of the individualism that once abounded in this country. A carefree spirit dominated much of the culture. Horace Greeley expounded on the youth to go west and they did so without a care in the world or a driver’s license. The cars, they were dangerous and needed registration, but the people could do as they wanted. Today, we have entered into a new Progressive Era. The genesis of this new progressive era occurred in the early 1980’s. People and politicians on both the left and the right are responsible for the overwhelming nanny state and political correctness currently being exhibited in this country. People like Jerry Falwell, Nancy Reagan and Tipper Gore were exhorting the dangers for the youth of America. Whether it was in the music that they listened to, the televisions shows they watched, the movies they saw or the drugs they smoked, the children needed to be saved. People like Ralph Nader and the American Trial Lawyers Association furthered the babying of America by requiring warnings on everything and suing the daylights out of companies. Tobacco companies and asbestos manufacturers may have had it coming with their hidden data and known dangers, but the process went too far. From the genesis of the early ’80’s we now have requirements that all cars sold in this country have backup cameras by 2018. Really, is this what has become of America? Mandatory backup cameras? People are too lazy to look behind them to make sure that they don’t run over little Johnny or Grandma Edna? Maryland is attempting to ban grain alcohol. Legislators in the state want to treat e-cigarettes the same as regular cigarettes, because “we don’t have enough data.” Uber and Lyft are under attack because consumers need to be protected from being “fleeced.” Obviously, the image at the top of the page references the now struck down ban on large sodas in New York City, even though Big Gulps would not have been banned, because of exceptions in the law. Towns in England text obese people trying to help them lose weight. Bans on foie gras, incandescent lights, chicken farming, circumcisions, fracking, vaping, hookah bars, guns, new bars, and many other things have all been proposed or passed. The problem though is that we have allowed the nanny state mentality to persevere since the original Progressive Era. Many of the very people who claim to be opposed to the “nanny state” are in favor of things like marijuana prohibition. How does this make any sense? The whole point of being opposed to the “nanny state” is that government does not know what is best for the individual. Remember what government is, a bunch of other people. There is no reason that this group of people should enjoy special powers to define what is best for society when there is no harm being done to society. Rules based on morals are inapposite to a truly free society. Tipper Gore wanted to ban WASP because she was offended by them. People do not have the right to not be offended by things. If people want to smoke weed and eat Fritos all day who are you to tell them that they can’t? If those same people decide to then drive a car, well that is a different story. The likelihood of harm resulting has changed the compass and that action is prevented not because of moral but because of the risk of impacting the rights to be free from harm of others. Many of the very people who claim to be opposed to the “nanny state” are also in favor of things like mandatory voter id laws. They use the fact that you need an id to do many things as an argument for why you should need an id to vote. Things like driving, fishing, hunting, buying alcohol, getting on an airplane, getting married, and entering state and federal buildings require licenses or ids. They never seem to question the need for such licenses or ids in the first place. Drivers’ licenses, car registrations, fishing licenses, hunting licenses, and marriage licenses are such an ingrained part of this society that no one ever questions why? Do drivers’ licenses and car registrations really protect people? Why does the state issue marriage licenses? Hunting and fishing licenses are purportedly for wildlife management, do they really work? I didn’t use to believe in slippery slope arguments. I thought that the were being exaggerated. In reality once the people in government have that taste of blood they will never relinquish power. A great example is smoking. First there were different sections in restaurants. Then there were separate rooms. Eventually, people had to go outside to smoke. After that there were lines drawn on the sidewalk. Then smoking was banned on beaches. Now it is being banned in parks. Of course now the dangers of second hand smoke are being called into question, but it is too late and the culture has adopted this as the way it is. The slippery slope is why we must protect our gun rights. It is why we must resist attempts to ban Everclear or vaping. We must stand up for what we believe in. It is a never ending fight. It started with those Progressive Era policies that were needed, took a break, then got a holy mandate in the 80’s and has accelerated with the Obama administration trying to give health insurance to everyone. Now, are all regulations bad, no. There are many, many necessary and important regulations. Quite frankly though many once passed and once needed regulations are no longer needed. Society has gotten past the reason for those regulations. I highly doubt that we still need to prohibit seven year olds from working in factories. We need a total reexamination of the laws in every municipality, state, and of course the federal government. Hell, we need a reexamination of the Constitution itself. What can we do better as a country to encourage freedom and liberty? We have learned a lot in two hundred and twenty-seven years. But we also need to be honest. Regulations that you feel are necessary to protect society, either from physical harm or from moral harm are no different than other regulations that people feel are necessary to protect society from physical or moral harm. 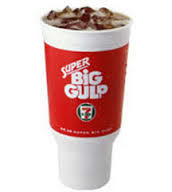 You can’t be for marijuana prohibition but against Big Gulp prohibition and have a consistent position. The reasons for allowing or banning are the same. We should allow people to consume these things because they have a right to determine what goes in their bodies and as long as what they do does not harm others the government has no right to ban an activity. The reason to ban such things is that the government has a duty to protect the individual from him or herself. The individual is either too stupid, too dependent or too lazy to know when they are being fleeced or harmed. Liberalism and nanny statism have such a low regard for the intelligence and ability of the people that you have to wonder when they will question the ability of the people to choose their own leaders. I sometimes question the wisdom of letting the people choose their own leaders myself. The evidence is in the corruption, incompetency, and general malaise exhibited by the leaders chosen by the people. Perhaps a rotating system would be better, but absent some major reform we are stuck with what we have. In the end we must require anyone who expresses a position to be consistent. We can not allow a position to change because of the room someone is in. In the end we must be for liberty. We must be for justice. We must be for freedom. If that means that some potheads make nothing of themselves and don’t reach their potential because they didn’t say no, well then so be it. This entry was posted in Politics, Uncategorized and tagged libertarian, marijuana, nanny state.